We do our level best to sort through the noise and bring you the best TV deals and reviews to help you make the right buying decisions, and steer clear of the sets worth avoiding. 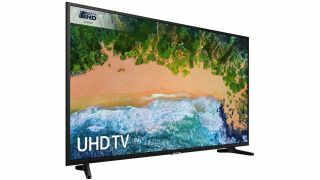 The Samsung NU7020 4K TV is attracting a lot of attention due to a knockdown price and some tempting deals on offer since Black Friday and running into the Christmas sales. So, available in four screen sizes (the UE43NU7020, UE50NU7020, UE55NU7020 and UE65NU7020), is this Ultra HD TV worth spending your money on? We haven't got a full Samsung NU7020 review but we can break down the specs and make an educated guess. The short answer: The Samsung NU7020 range offers a lot of screen and the latest 4K picture technology for a crazy low price. Whether you want to buy the 43in, 50in, 55in or 65in, all four are available at £200 off, and each offers an impressive spec. It's one of Samsung's entry-level 4K LCD TVs, which means it doesn't have all the very latest picture technologies, and it doesn't benefit from a QLED screen, but it does offer all the basic features and key functions you'd expect from a 2018 4K TV. So long as you don't mind missing out on the latest and greatest picture performance, this TV will likely deliver great performance-per-pound value. And we think the 50in Samsung UE50NU7020 is probably the best deal of the lot. Want an alternative? See our round-up of the best 2018 4K TVs. The Samsung NU7020 TV range appears to be a relatively new addition to the Samsung 2018 TV range. It sits well below the company's flagship QLED TVs (the Q9, Q8 and Q7) - QLED is Samsung's answer to OLED screen technology - and even below Samsung's premium LCD screens, such as NU8500, the NU8050 and the NU8000. Below these TVs come the NU7500, NU7400, NU7300, NU7120 and NU7100. After these sets, comes the NU7020 range. So it's an entry-level 4K TV, hence the budget price. The NU7020 is available in 43-inch, 50-inch, 55-inch and 65-inch TV screen sizes. So what do you get? You get a 4K Ultra HD resolution, edgelit LED screen. Direct LED will tend to deliver better pictures than edgelit but it's no surprise that isn't on board here. There's no sign of Samsung's premium Dynamic Crystal Color or HDR 1000 tech either. The Samsung NU7020 range supports some of the latest picture tech but not all of them. So there is support for HDR10+ video but no sign of HLG support. This is the picture tech used for 4K live broadcast content by the BBC, so you won't get 4K iPlayer support at the minute, for example. There are two HDMI inputs, which is a little on the low side, plus two USB inputs and a digital optical audio connection, which may be handy for connecting to some soundbars. So while some of the best picture processing is missing, this Samsung TV range does deliver when it comes to the streaming video specification. BBC iPlayer, ITV Hub, All 4, My5, Netflix 4K, Prime Video 4K, Love Nature 4K, TV Plus, Disney Life, Rakuten TV, Now TV and YouTube are all here. The Samsung App Store gives you access to more apps, too. So that's the NU7020 specs. What about the Samsung TVs we have reviewed? We have mainly focused on the flagship Samsung QLED TVs this year, which we're big fans of, receiving a number of five-star reviews. But last year we saw the budget Samsung UE32M5500 and were impressed with its performance for a £300 32-inch TV, awarding it five stars. The UE65MU7000 also received five stars, a relatively affordable 65in TV for £1650. So Samsung has excellent pedigree when it comes to recent TVs, which means we're confident if you're happy with some of the missing tech specs, which may only concern the most discerning of early-adopters, then the NU7020 looks like a deal worth taking a punt on. Verdict: It won't beat the premium TVs for picture quality and the tech spec isn't entirely comprehensive but for most people, saving £200 on the Samsung NU7020 TV range, looks a pretty good bet.